"A letter found in a mound northwest of the modern town of Ta'annek written in the fifth century B.C. proves that 'Yah'was a deity of the Canaanites. Yah is associated with the Canaanitish Mother-goddess, Ashtart-Anat as seen by the Father-Mother titles of the deity of the Jews at Elephantine. There, the title of Anat-Yaw is seen as well as Ashim-Bethel and Afat-Bethel where the titles of Astarte are combined with the Sun-god, Bethel. At Gaza, Yah appears as a Sun-god on a coin and coins were frequently inscribed with the figure of Ashtart-Yaw, Anat-Yaw, and Anat-Bethel, which corresponds to the Phoenician Melk-Ashtart and Eshmun-Ashtart" - The Mythology Of All Races, Vol. 5, p. 44. "Many Vedic chants of praise also contain Yah, e.g. Rama-yah, Isha-ya (Yah my Divine Husband), Jai-ya (Yah as joy); Shiva-ya (Yah is purity, holiness, truth); Krishna ya (Yah is the transcendental loving Witness); Vishnu yah (Yah is all pervasive Light); Kali ya (Yah is the creative manifesting force or energy)." etc. etc. "Baal (#H1180) from ba'al with pron. Suff. ; my master; Baali, a symbolical name for Yah & Jehovah -- Baali." from baal with pronoun suff. From ba'al with pron. Suff. ; my master; Baali, a symbolical name for Jehovah -- Baali. The Jewish encyclopedia ("Adonai and Ba'al") reveals: "The name Ba'al, apparently an equivalent for Yhwh." Baal, also rendered Baʿal (Biblical Hebrew בַּעַל, pronounced [ˈbaʕal]), is a North-West Semitic title and honorific meaning "master" or "lord" that is used for various gods who were patrons of cities in the Levant and Asia Minor, cognate to Akkadian Bēlu. ABaalist or Baalite means a worshipper of Baal. "Baal" may refer to any god and even to human officials. In some texts it is used forHadad, a god of thunderstorms, fertility and agriculture, and the lord of Heaven. Since only priests were allowed to utter his divine name, Hadad, Ba‛al was commonly used. Nevertheless, few if any biblical uses of "Baal" refer to Hadad, the lord over the assembly of gods on the holy mount of Heaven; most refer to a variety of local spirit-deities worshipped as cult images, each called baal and regarded in theHebrew Bible in that context as a "false god". 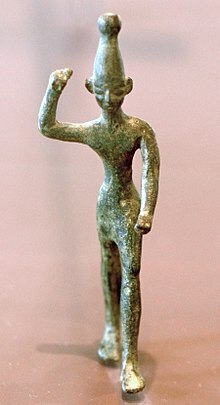 Bronze figurine of a Baal, ca. fourteenth-twelfth century BC, found at Ras Shamra (ancient Ugarit) near the Phoenician coast. Musée du Louvre.